You know that feeling of utter bliss you experience after a great yoga session? Calmness of the mind, stillness of body, and warm, positive vibes coursing through your chakras. …and so do I, so I’m hooking you up with a fab giveaway at the end of this post! As seasoned yogis and beauty masters (both hailing from powerhouse Aveda), Emmanuelle Rey and his wife Suzanne felt it was time someone designed a line of face, body, and hair products specifically for those of us who enjoy the wellness lifestyle that goes along with yoga. With amazing scents and pure ingredients leading the process, they set out to create a line of yoga beauty products that could be incorporated into your life on and off the mat. 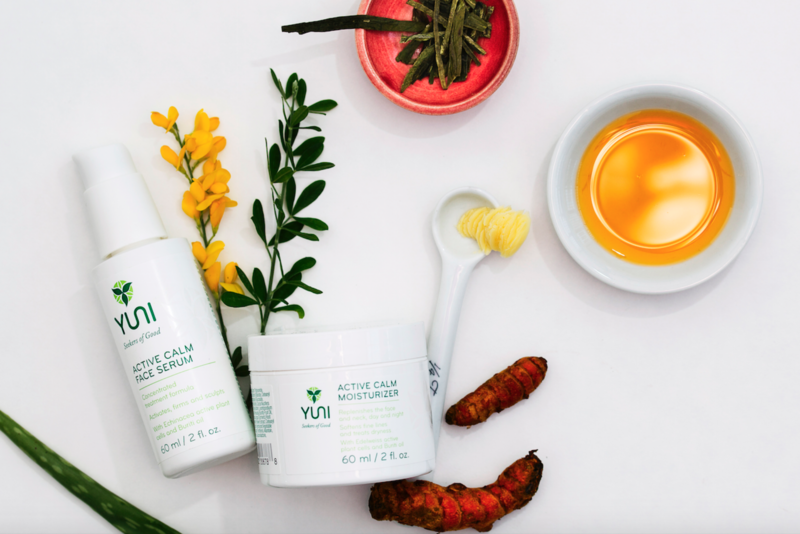 YUNI, whose tagline is “Seekers of Good,” uses only naturally-derived ingredients like essential oils and plant stem cells. All of their scents are 100% natural and every product is biodegradable and compostable. Even their locally-based factory in Hermosa Beach (which conducts testing on humans not animals) is environmentally-friendly, using solar power technology. What’s not in these products? 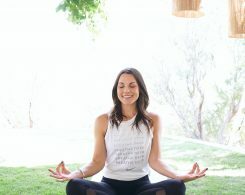 At their recent LA launch party, I had the pleasure of experiencing the whole line first hand during an relaxing yoga sesh led by Sara of Venice’s Yoga Nest. If you’re a serious yogi (or just a lover of amazing beauty products), here are a few of the products I’d recommend to take your practice to the next level. This roll on gel uses arnica flower extract to soothe sore muscles and reduce swelling, bruising, and pain. It also contains peppermint oil, whose menthol scent has been proven to reduce the perception of pain. Roll this on after an intense yoga sesh or long run to release tension, or hand it over to your honey for a cooling massage. Sometimes there’s just no time to shower after a workout. These instant shower sheets will help you clean up quickly after a sweat sesh. They contain peppermint leaf oil, which acts as a natural antiseptic and reduces bacterial activity on the skin without drying it out like alcohol would. 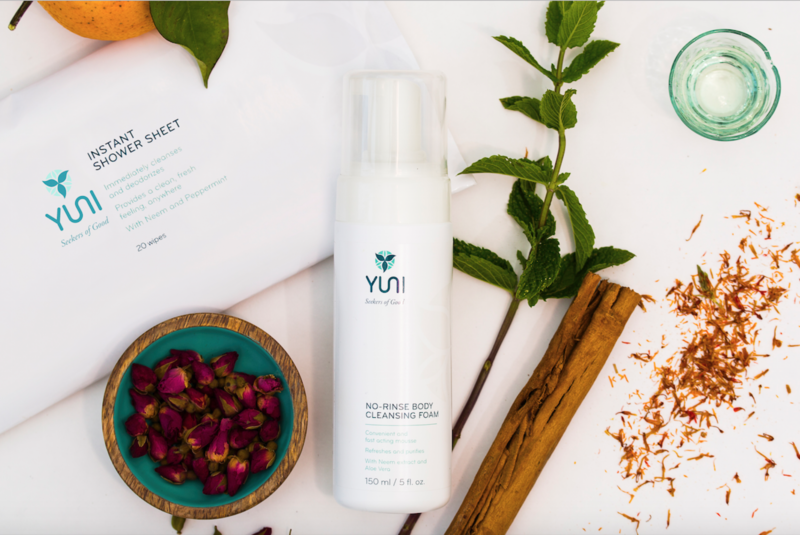 Follow up with the no-rinse cleansing foam which contains Neem leaf extract and aloe vera to calm and soothe the skin. Both dry instantly, leaving no icky residue, so you can get on with your day feeling so fresh and so clean. One of my favorite parts of yoga is the last couple of minutes in Savasana when the instructor comes around and gives you a mini massage. Not everyone does it, and I think it makes a big difference. It’s even better when they incorporate a scent into the experience. Some will rub an oil between their hands and wave it in front of your nose, helping to anchor you in the moment. 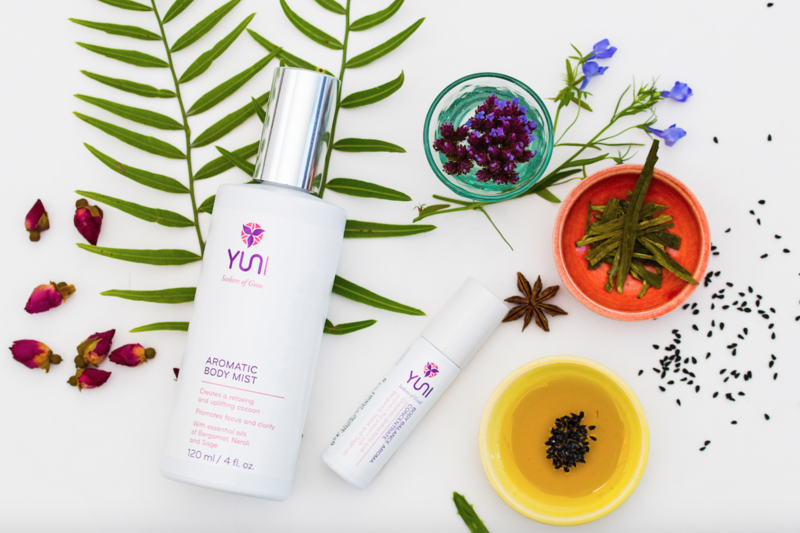 YUNI’s body mist is the perfect aroma for this with it’s refreshing and focusing blend of geranium, bergamot, neroli, and sage. We sprayed it on our hands before our final savasana in class and it totally intensified the experience. 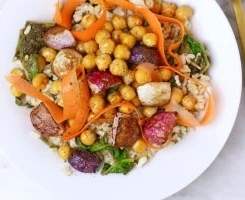 YUNI officially launches later this month and will be available on Yuni’s website, but today, I’m going to give 4 readers the opportunity to try the line! I’m giving away 4 YUNI travel bags filled with tons of their awesome yoga beauty products. The giveaway will run until next Wednesday. Weigh In: What’s your favorite beauty line? Is it important to you to find natural beauty products? How do you cleanup after a workout when there’s no time to shower? I have to say it depends on the day as to what my favorite yoga pose is but Pigeon pose is usually high up there. I just love how you feel when you come out of it! Also, it is important for me to find natural beauty products which is why I have been trying to use things like Witch Hazel and Coconut oil in place of actual brand products that I can’t trust what goes into them! Child’s pose is still my all-time favorite. 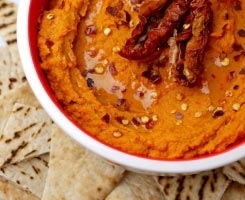 These products look awesome! Burt’s Bees is one of my go-to natural brands. I make a lot of my own beauty products like sugar coconut oil scrub. I use Jucie Beauty items also. Great shots, Whitney! Must check this stuff out like, now. I like these bath salts by everyone bath– they sell at WholeFoods & help with muscle soreness. My favorite pose is Camel. It feels so awakening and is such an amazing stretch. An instant mood lifter! Down dog is my fav. Oh I love these! Haven’t tried them but I already know I love them :-) My favorite pose would have to be triangle pose. A strange one to love but I enjoy having the hamstring stretch along with a little back, side and shoulder stretch. It’s just awesome! Oh I love the sound of the instant shower sheets! Especially if I’m off to grab a coffee on my way home from working out. Sounds like a beautiful natural brand! My favorite yoga move is child’s pose lol ….not fancy but love it on my low back! My favorite yoga move is a sun salutation! It stretches every muscle in the body and gets me pumped to start my day! Downward Dog is my favorite yoga pose.